Dental implants involve surgery and they can take you up to five months to be finished – so how can you associate dental implants with low levels of stress? Let’s get one thing straight: dental implants come with a certain level of post-procedures discomfort that anyone can cope with if they follow their doctor’s orders. When we talk about stress-free, we don’t refer to the usual level of discomfort pertaining to a dental service, but to a whole range of anxiety-inducing problems that people fear so much, they avoid getting a dental implant at all. Our dental implants Fort Lauderdale FL experts are here to explain dental implants by answering some of the most common question they hear. 1. What If I Reject the Implant? Our doctors and implantology experts have nearly 60 years of combined clinical expertise; they use the latest biocompatible materials, equipment, dental kits, and techniques to ensure the success of your implant; they also follow continuous education and training in implantology so you have nothing to be stressed about. You won’t get a dental implant without a thorough diagnosis as age, smoking or immune system-related health issues might not make you eligible for an implant; in this case, your doctor will present you with alternatives. 2. How Long Will My Implant Last? If properly placed and cared for, your implant may last up to 20 years with no major interventions. Your implanted tooth – after it heals – will look, feel, and function just as a natural tooth and you will even forget that it was implanted. 3. Is the Procedure Painful? The actual procedure is not uncomfortable. 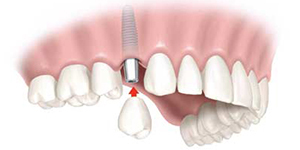 Our expert dental implants Fort Lauderdale FL surgeons use the best and safest anesthetics and procedures to make your experience as stress-free as possible. You will also enjoy our in-office comforts and amenities, the positive and warm atmosphere and our impeccable patient care methodology. 4. Is the Procedure Expensive? You shouldn’t feel stressed about money either: we will creatively and actively work together with you so you can get the best dental care in an affordable manner.